Several months ago I made a denim jumpsuit and found the final look to be unflattering on me. However, this was high-quality denim, and I refused to throw it away. I went with the next best option, refashioning it into a new dress for my niece. I used a pattern I was already familiar with (pattern review here), so it took no time to make her dress. I used my sewing machine embroidery feature for the designs on her dress and added a trim to the hem. It took about four hours to complete her dress from cut to finish. But after I finished it I realized I didn't even own a denim dress, which made me really want to make one for myself. I combed through my stash and looked for denim remnants left over from previous projects. I had two different types of denim: two different shades of lightweight denim and a heavyweight denim. Altogether the pieces equaled to about two yards of denim fabric. I wanted my dress to be similar to my nieces, but I also had to be mindful that my denim was literally in pieces, which would affect pattern placement. Ultimately, I settled on New Look 6509 to create my look. Let's talk construction. First, I like that this pattern comes as a dress or jumpsuit. I chose view A, honestly, because it seemed to be the simplest after I read the instructions for each view. 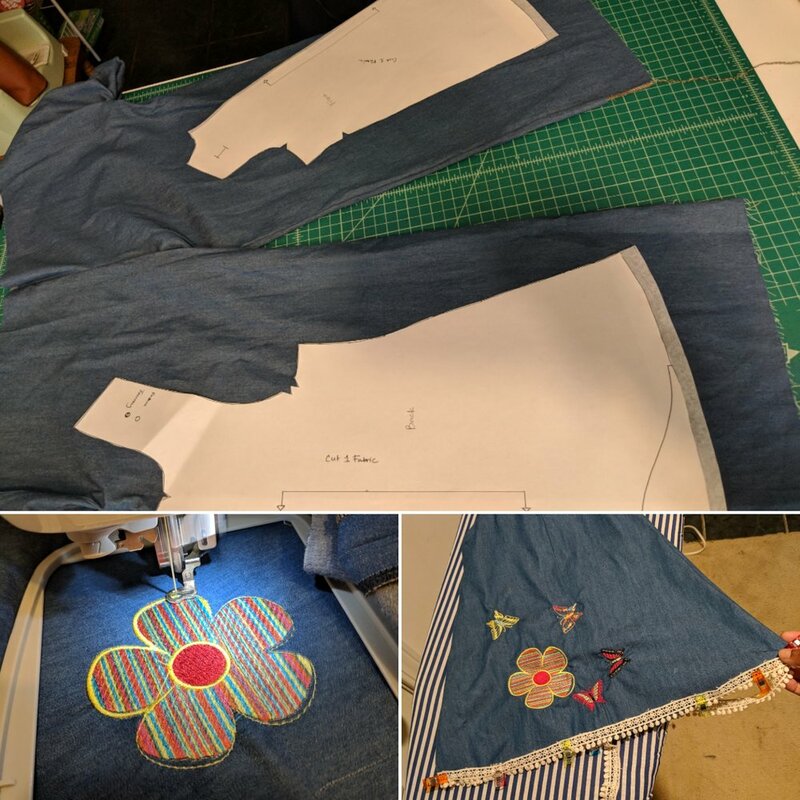 I was not interested in doing a complicated project, and I knew that the pants or shorts jumpsuit would require me to do several modifications. Second, this was a relatively easy make. It took me about three days to sew my dress, and in total, I think I worked on it for 13 hours from cut to finish. I was meticulous in taking my measurements and decided the size 12 would fit best on me. Marking all the darts and notches and then sewing the darts took the longest. The dart marking went faster than usual because I used wax paper to mark the darts. I was inspired by my niece's pattern cover, New Look 6576, and embellished my dress a little. I created the denim dots by fusing HeatnBond Iron-on Adhesive to a square of my lightweight denim fabric. Then I drew circles onto the square, cut them out, and fused it to the dress. The only change I made to the pattern was omitting the bodice lining and opting for a facing because I refused to sew those darts twice. The upper portion of the bodice was a bit wide when I finished it, so I trimmed it down before adding the buttonholes. All in all, this is a great summer dress pattern. I like the fact that it could be worn with or without a shirt. Plus, I mean pockets on a dress, what more can you ask of a dress. I intend to attempt to make this again in a rayon challis but time will determine if that actually happens. I already have my last two summer projects picked ou, and I don't want to make a detour if I can help it.